Turn to Budco for the high security seals you need for tamper detection, high-value cargo protection and critical supply chain security. As a leading stocking distributor, we are proud to offer a comprehensive selection of high security seals that are Customs-Trade Partnership Against Terrorism (CTPAT) compliant to safeguard our valuable trade industry. Many of our high-security seals also meet the ISO 17712:2010 standard for both safety and quality. 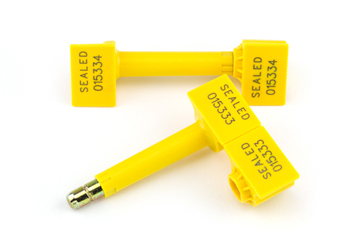 Budco C-TPAT High Security Seals are available as both cable seals and bolt seals to meet your specific application. Our SnapTracker Bolt Seals, for instance, feature a solid steel bolt with a molded plastic coating to provide both barrier-class security and tamper evidence. Click here to see SnapTracker Bolt Seals and our entire collection of C-TPAT Security Seals.